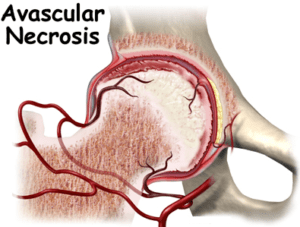 Ischemic necrosis or avascular necrosis (AVN) occurs when the blood supply to a region of bone is disrupted, and then the bone dies or becomes necrotic. This may result from trauma such as a sports injury or medical disorders. 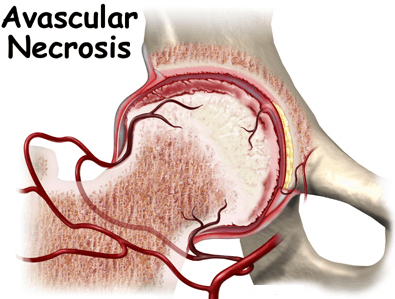 Avascular necrosis (AVN) can occur in most any joint, but is more commonly seen in the hips, shoulders, and knees. AVN may be seen in medical conditions such as rheumatoid arthritis, Lupus, sickle cell anemia, and after high dose steroid usage in certain conditions. Stem Cell Therapy has been used to treat these conditions. 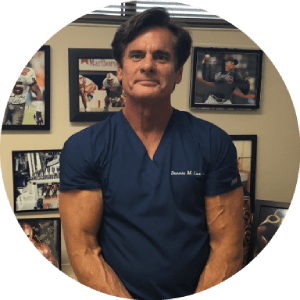 Dennis M. Lox, MD, is an expert in Sports and Regenerative Medicine, concentrating on Platelet Rich Plasma (PRP) and Stem Cell Therapy. Dr. Lox has expertise in ischemic or avascular necrosis from sports injuries to medical problems. If you are an athlete and think you may have AVN contact Dr. Lox, as early intervention may improve your outcome.